iPhone App Reviews » WTF?! Michael (Admin) | Jan 6, 2010 Entertainment, WTF?! Don’t be shocked if you see Michael Scott using this app in a future episode of The Office! Pocket Performance Review is a collection of executive decisions that are vocalized by 12 different personalities that run the gamut from a typical office chump (Mr. Littleman) to a gangsta (Master B) to a granny (Nellie). 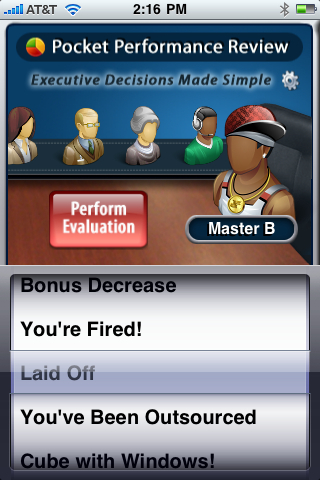 You can change the names of the personalities if you want, and by either shaking or selecting the various recordings you’ll be able to tell people that they’re fired, laid off, outsourced, taking an unpaid leave, and numerous other types of bad news. It’s not all bad, though, as Back Pocket Software also threw in a few positive messages to tell your minions that they’ve been given a raise or been promoted. Shaking your iPhone or hitting the “Perform Evaluation” button will select a random message, and you can rig it to land on the evaluation of your choice. Pocket Performance Review is a joke (literally) and I think it has high potential for being the source of your next office prank if you feel like getting creative. It’s nice and polished, and for the time being it’s free!